polypeptide chains joined by three disulfide bonds; two of the polypeptide chains span the cell membrane (to effect the signal transduction for the hormone receptors) and two polypeptide chains lie entirely outside the cell. All of the proteins-receptors described in Figure 1-23 have regions that are rich in cysteine residues (indicated by the shaded regions). A more detailed depiction of the insertion of a seven-membrane-spanning receptor is given in Figure 1-24. 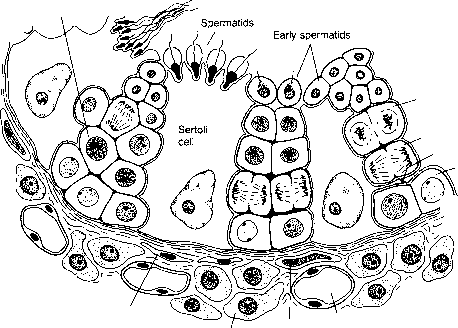 This illustrates both the beauty of the organizational detail as well as the complexity of this family of receptors. The intracellular components of membrane receptors, as suggested in Figure 1-22, are concerned with the signal transduction component of the receptor. The single-membrane-spanning class of receptors frequently has an enzymatic activity associated with the hydrophilic peptide moiety extending into the interior of the cell. This can take the form of a tyrosine protein kinase. Thus, when the receptor is occupied, the kinase activity becomes activated, and substrates for the kinase inside the cell become phosphorylated on tyrosine residues (see Figure 1-22B). The Tyr-PK activity is created by the secondary structure generated by a span of approximately 250 amino acids. Frequently, at the C-terminal domain of this peptide region is a tyrosine residue that can become autophosphorylated by the Tyr-PK activity of the receptor. Figure 1-25 illustrates the size and location of catalytic activities of membrane-spanning receptors and some related intracellular enzymes, like protein kinase C (PKC) or phos-phorylase kinase. The multiple-membrane-spanning receptors also belong to a family of membrane proteins that function as ion pumps, e.g., Ca2+ ATPase, Na+ K+ ATPase, or H+,K+ ATPase. These enzymes are also composed of seven-membrane-spanning regions, which display sequence similarity to the hormonal receptors but lack the ligand-binding domain. As illustrated in Figure 1-22C, the receptors with seven-membrane-spanning components interact with separate membrane components known as G proteins (these will be discussed in detail later in this chapter) to effect the signal transduction process. Finally, the intracellular components of all four classes of membrane receptors may contain serine or threonine residues that can become phosphorylated; the presence of the protein-bound phosphate then, in some fashion, can alter the properties of the signal transduction process. Table 1-4 tabulates some examples of hormone membrane receptors. The great bulk of receptors for steroid hormones has been shown unequivocally to exist in the nuclear and cytoplasmic compartments of the cell. It is an area of continuing research and debate as to whether receptors for steroid hormones exist in the outer cell membrane. A membrane receptor for progesterone has been described in the cell membrane of the Xenopus laevis oocytes, and it has been functionally implicated in the process of meiosis. Also, there are indications that there may be a membrane receptor for 1,25-dihydroxy vitamin D3 in the basal lateral membrane of the chicken duodenum that is involved in the process of intestinal calcium absorption. FIGURE 1-27 Steroid receptor gene superfamily. Abbreviations: T3, triiodothyronine; RA, retinoic acid; D3, 1,25-dihydroxyvitamin D3; E2, estradiol; CORT, Cortisol; ANDR, androgen; PROG, progesterone; ALDO, aldosterone. The N-terminal domain (open rectangle to the left of the DNA-binding domain) represents the sequences of least homology among the receptors. This figure roughly shows the relative sizes of these receptors. The information is derived from the laboratories of R. Evans, K. Yamamoto, P. Chambon, and others. In some cases there is high homology in DNA-binding domains and lower homologies in ligand-binding domains.